A Bowdoin squash alum introduced me to VolunteerMatch, a wonderful website that connects nonprofit organizations with volunteers. Hence, in an effort to continue volunteering locally I was matched with Emmaus Inc, a Haverhill, Massachusetts-based nonprofit organization that addresses homelessness through empowerment. How did this happen? 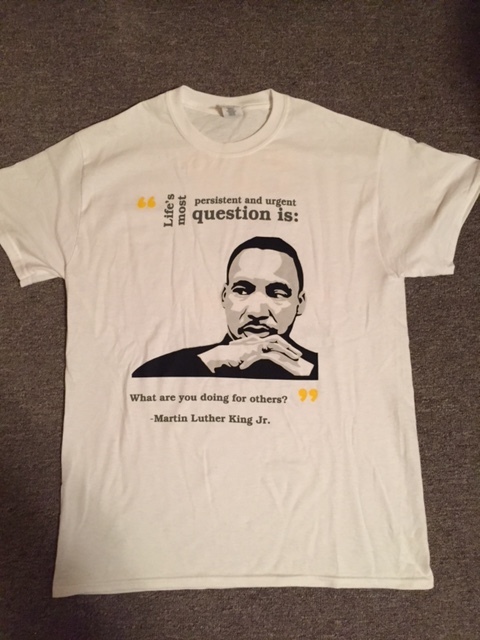 Emmaus Volunteers received the T-shirt above for its 4th Annual 2017 Martin Luther King Day of Service. The process to act upon my volunteer interest was to register with VolunteerMatch, express interest in organizations and causes near my zip code and then select volunteer opportunities based on mutual interest and availability. My first onsite meeting with Emmaus’s Empowerment Project Coordinator facilitated registration, identification verification and completing background (CORI) checks. I was then emailed by the coordinator the general volunteer responsibilities. As a Family Guide, my volunteer role for the 2017 Emmaus Martin Luther King Day MLK Day was to provide a welcoming atmosphere for disadvantaged families and individuals at the Resource Fair and Family Theater Almost 200 people from the Haverhill community attended the event and Emmaus Inc had over 130 volunteers respond to the call to work on various MLK day projects. Each volunteer received a free T-shirt, as seen above. For more information, check out pictures from the event on the Emmaus Inc. social media pages! Thank you to VolunteerMatch for helping me to make the Emmaus event a success. If you are looking for ways to give back to your local community, connect with like-minded individuals and organizations as well as ease your way your back to full-time paid employment, VolunteerMatch, might be a useful tool to make your next steps in the new year. What Happens to Athletic Coaches Living with Mental Illness? I was diagnosed with schizo-affective disorder in 2014 after 2 psychotic episodes in my early to late twenties when I literally lost touch with reality. Thanks to excellent treatment by mental health professionals and unconditional support from my caregivers, I was able to go back to work, but relapsed in my late thirties after two suicides in my family and social networks. A few life changes later, I was unable to follow instructions, process information and became socially anxious. Today it is a burden for me and my loved ones that I need to undergo rehabilitation and find a new direction for my life. The world of sport is not immune to mental illness as it can strike anyone regardless of age, race or socio-economic background. There are many professional athletes who struggle daily with their illnesses. Some athletes, are open about their diagnoses while others suffer in silence. Unfortunately, the stigma of mental illness does not align well with high performance situations. Athletes, musicians and entertainers are no different from any other human beings on this planet. A 2012, New York Times article titled “With no one looking, mental illnesses can stay hidden,” prompts me to ask the question about what are the long term outcomes of athletic coaches with mental health conditions? Visit to United States Olympic Training Center, Colorado, Colorado Springs. Photo credit: T. Mohammed, 2008. My illness has no cure and it is something I will have to manage carefully for the rest of my life, by taking medication and undergoing therapy. During the summer of 2008, my sister Miriam, invited me to visit Colorado where I visited the United States Olympic Center’s Training Center in Colorado Springs. 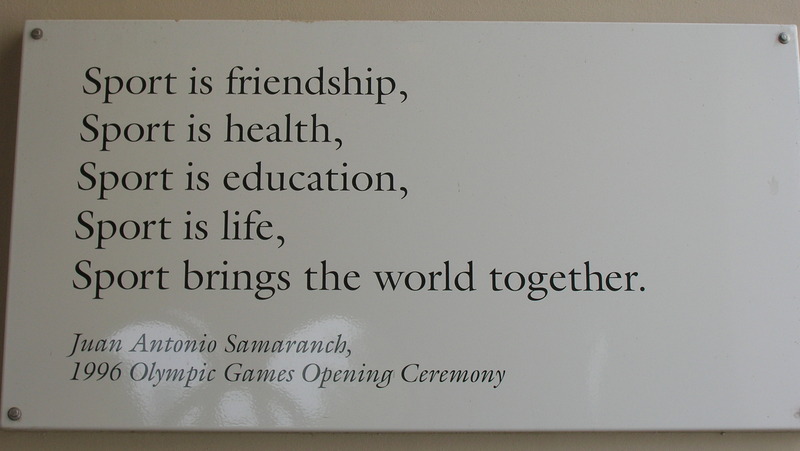 At the Center, I saw the above inspirational quote by Juan Samaranch, former President of the International Olympic Committee. This resonated with me since my life has been enriched with, through and by sport. Setbacks occur, but life goes on. My onward journey will be to practice greater self-care and be a resource for others with mental illness, in a voluntary capacity, whenever possible. Concerts for Sport for Development and Peace? A few years ago I blogged about what the field of sports for development and peace can learn from the arts? Music is often considered a great communication tool to bring people together. There have been many types of benefit concerts during my lifetime. The LiveAid, Farm Aid and Live 8 concerts are some of the larger benefit concerts that have happened across the globe. Patrick Kabanda, a friend at the Office of the Chief Economist at the World Bank, has written extensively about the importance of the arts to economic and social development. His publications offer great insights. I recently attended a Lampedusa, a Concert for Refugees in Boston at the Berklee College of Music. It was a sold out show with humorous dialogue and well crafted songs by all the musicians. Clearly, such an event is a win-win situation for the musicians, fans, sponsors and aid recipients. Small scale concerts may be just as good as large scale events in that they can draw loyal fans and supporters. Professional athletes and musicians are often grouped together in the entertainment business which may lead to ease of working together. Personally, the Lampedusa tour stop in Boston, happened to be on my birthday which made it all the more special and memorable. As a member of the International Sport for Development and Peace Association (ISDPA), I would urge my colleagues in the field to explore ways in which benefit concerts can be used as a fundraising tool to benefit disadvantaged athletes. Choosing which non-governmental organization to benefit from the concerts could be done based on pooling of resources. For example ISDPA, could collect the funds and make equal distributions to its member organizations. In the United States, Up2Us, a sport-based youth development coalition would be a good starting point. An event organizer, may ask is there a demand for such a concert to benefit disadvantaged athletes? My answer would be, just ask around and you never know if there are a group of musicians passionate about similar issues. India, Uganda and USA: What Can We Learn by Comparing and Contrasting in Youth Development? As mentioned, in earlier blog posts thanks to my formative United Nations Volunteer experience in Uganda, I’ve spent considerable time and energy as a founding team member of Khelshala in India. In the last couple of weeks, I was fortunate to attend fundraisers at Khelshala in Boston and the The Child Is Innocent in Boston. For both of these non-governmental organizations, this was my second time attending their fundraisers. Listening to Satinder Bajwa (an engineer by training, turned coach and teacher) and Kevin Schwartz (a pediatric oncologist), as co-founders of their respective non-governmental organizations, I was reminded by other inspirational leaders I’ve heard speak at the Harvard Kennedy School in the social enterprise movement such as Mohammed Yunus of Grameen Bank or Bill Drayton of Ashoka, who have used their talents to improve the lives of the next generation of leaders. The objectives and challenges facing both Khelshala and The Child is Innocent are simultaneously similar and different. Today, perhaps more than ever, it is possible for young people to make a difference through grassroots activism, social justice campaigning and demonstrating solidarity with those who are disenfranchised. Small steps taken over a long horizon can and do make a difference for organizations like Khelshala and The Child Is Innocent. How and when will you make your next step? As a Bowdoin alum living in the Boston area I have enjoyed participating in the Common Good Days organized by the College. In 2016, the Bowdoin College Common Good Day in Boston was held at Pine Street Inn, a homeless shelter for men. Over the years, the College has selected different nonprofits across the country to perform a day of service. This year’s event saw almost 500 alumni, faculty, staff and friends participated in Common Good Days with various nonprofits in different cities. In Boston, there were 12 alumni and friends stationed in the Pine Street Inn kitchen to assist the staff with basic meal preparation. Bowdoin Alumni and Friends at 2016 Bowdoin College Common Good Day at Pine Street Inn, Boston, MA. Photo credit: Pine Street Inn Staff. Alumni from a wide range of years, professional backgrounds and communities enthusiastically cooperated with the Pine Street Inn staff in helping to cut tomatoes, cucumbers, onions and chicken to make sandwiches for residents. Pine Street staff were generous with their time and guidance to offer a personalized tour of the facility to see how the shelter fulfills its mission. We shared stories of our Bowdoin years, previous volunteer experiences and current professional roles. Though we had never met before our common links through Bowdoin allowed us to focus on the task at hand while seeking a greater understanding of the significance of Common Good Day. This marked for me a decade of participating in Common Good Days organized by the Bowdoin Club of Boston. Based on the conversations with fellow alumni at Pine Street Inn, the meaning of service varies from individual to individual. Being part of a group, working towards a common goal, helping to improve society all with a bit of fun – are some of the many reasons why people participate in such events. However, a humble suggestion for future Common Good Day planning could entail greater follow through and assessment of the impact of days of service events for long term sustainability of the organizations and individuals it aims to benefit. Sports Memorabilia: Is at an excessive love of sport? 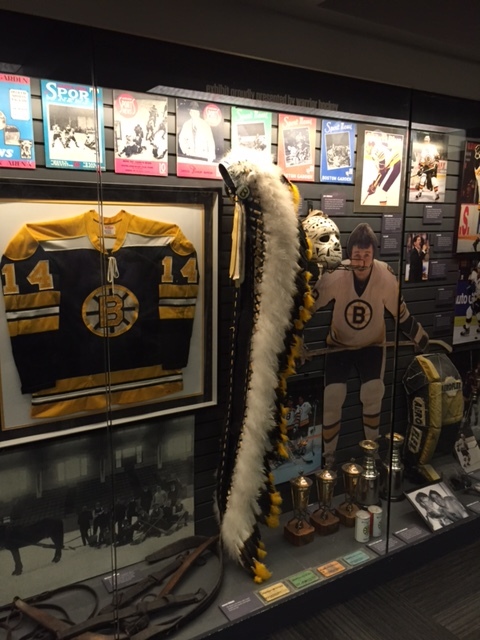 If you happen to live in the Greater Boston and are looking for a way to inspire your son or daughter with a dose of Boston sports history, then request a museum pass from your local library. 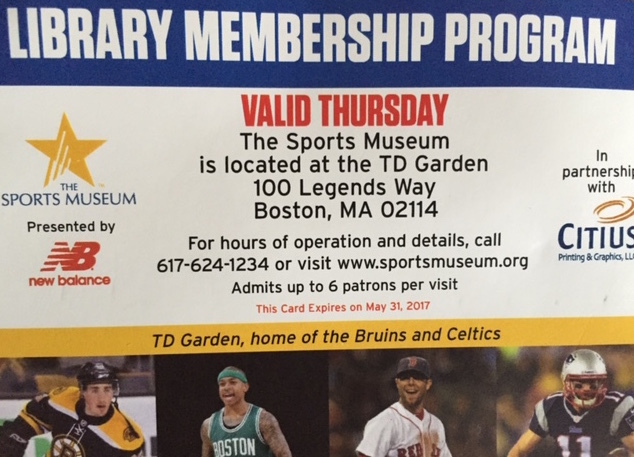 Thanks to the Memorial Hall Library Membership program (my local library) a free entry pass to The Sports Museum in Boston made it possible for a summer visit. Museum Pass made available through Library Membership Program at Memorial Hall Library, Andover, Massachusetts. The Sports Museum was a new discovery for me given that one has been traveling from country to country observing sport for development and peace practices. What I found unique about The Sports Museum was that it provided a greater awareness of the four major American sports – football, baseball, basketball and hockey – which were all highlighted in some way during the tour. Our young tour guide was very knowledgable and had lots of great stories about Boston sports personalities. Sports memorabilia in The Sports Museum, Boston, Massachusetts from July, 2016 visit Photo credit: T. Mohammed. Furthermore, since the professionalization and specialization of sports in the United States, there are dedicated “Hall of Fame” for sports such as tennis and squash (both in the New England area too). Such devotion and allocation of resources to sport does not typically happen in low-income countries since there are more pressing needs like water, sanitation, electricity, agricultural development and housing, for example. Is this excessive love of sport in high-income countries or should low-income countries also strive for such development? This is an ongoing debate within international development circles on whether sport is a “cost-effective” social and economic development tool in low-income countries. The 2016 Olympics in Rio, has an opportunity to leave a positive legacy for Latin America and the rest of the world. The 2012 London Olympics’s International Inspiration certainly did for 12 million children in 20 low-income countries. On 9th August, 2014, Khelshala celebrated its 5th anniversary in Chandigarh, India. Unfortunately I was unable to attend the event, but was celebrating in spirit with colleagues. Since I was not in Chandigarh to report on what took place, the India-based team are putting together a post-event synopsis. Once again credit goes to Coach Bajwa and the Khelshala team for reaching this milestone. While there is still a long way to go, there continues to be significant achievements made by the Khelshala children as well as the program itself. For those interested in the details, these can be found in the Khelshala newsletter(s).